No matter what your needs for towing, recovery, specialized hauling and road service, you won’t find a company with more capability and versatility than C&L Towing. We employ a diverse range of specialized equipment and experienced staff to complete any assignment — from a jumpstart at the mall to uprighting an overturned tractor-trailer during rush hour, C&L Towing offers rapid, efficient and professional service. 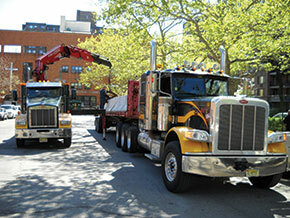 Charles Napoli, Jr., president of C&L Towing, started out in 1984 with one tow truck. Today, the company has grown to six highly successful locations with over 80 pieces of state-of-the-art equipment and over 100 employees. Our locations are staffed by trained and nationally-certified employees on standby 24 hours a day. Nights, weekends or holidays, you will encounter no answering machines. Whether you call us twice a year or 10 times a day, we adapt to your individual needs to provide a level of service that has made our success possible. Ninety percent of our business comes from repeat customers — that says it all. Fast and professional service to all five boroughs of New York City.